The first race to France for the 2011 RORC Season’s Points Championship proved to be extremely competitive. With over 100 entries for the Cervantes Trophy Race, the Royal Yacht Squadron line was a cauldron of activity and a magical sight as the fleet set off downwind under spinnaker towards The Needles. After a beat around the south side of the Isle of Wight, the fleet rounded the Nab Tower to bear away for a fast passage across the English Channel. The majority of the fleet completed the 125 mile course in less than 20 hours. Gray and Laidlaw’s Farr 52 Bob took line honours by nearly three hours and also won the Cervantes Trophy for best yacht overall on corrected time. Charles Ivill’s Grand Soleil 54 John B corrected out as winner of IRC One. Two First 44.7s had a close battle for second in class. John Stapleton’s Vespucci’s Black Sheep eventually took the runner up spot in IRC One. Andrew Arthur’s Koko Kai was third. The class also contained four identical Challenge 72s competing for the Tall Ships Youth Trust. Stephen Durkin’s Challenger 4 was first home in an elapsed time of just over 18 hours. The Tall Ships Youth Trust is dedicated to the development of training young people through sailing and the Cervantes Trophy Race was part of their preparation for the Rolex Fastnet Race later this year. RORC Commodore Andrew McIrvine scored his first win of the season, taking IRC Two in his First 40, La Réponse. Neil Kipling’s J/122, Joopster enjoyed the fresh conditions to claim second place in class but by less than two minutes on corrected time from X-40 Exception owned by Frenchman Patrick Ponchelet. Noel Racine’s JPK 10.10 Foggy Dew won her class in the Cervantes Trophy for the second year running. Enjoying the big breeze, the Le Havre-based yacht was also the first boat home in IRC Three. William Hutchinson’s Dutch Ff110 Fandango had a high-speed surfing duel with David Aisher’s J/109 Yeoman of Wight crewed by the British Keelboat Academy. Fandango took second place by just 23 seconds on corrected time. IRC Four was decided by just 30 seconds on corrected time with two French yachts battling it out. Philippe Rios’ Dufour 34 Gwaihir Ventur won the class with Frederic Waniart’s Aphrodite 101 Vim second. Dorset-based Ian Braham, at the helm of his MG 346 Enigma was third. 19 yachts raced to Le Havre doublehanded, nearly double the amount from last year’s Cervantes Trophy race. Vim scored a memorable win, beating Rolex Fastnet winner, the X-35 Exile/Mirabaud, skippered by Nicolas de la Fourniere. Peter Olden’s A-35 Solan Goose of Hamble was third. After enjoying the warm hospitality of Le Havre, competitors returning to Cowes enjoyed a race back across the English Channel. 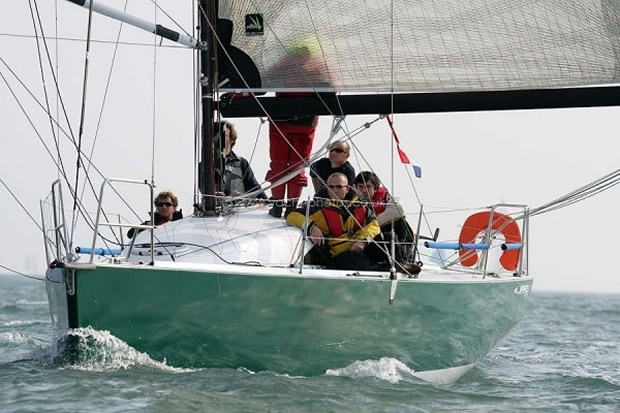 The Trophée Guillaume Le Conquérant is organised by the Société des Régates du Havre in association with the Royal Ocean Racing Club and the Island Sailing Club. Racing resumes for the RORC Season’s Points Championship the 14 May with the De Guingand Bowl Race.